Once you complete your iBuildApp Custom Mobile App you have a chance to promote the app so that other people can learn about it and download it on their phones or tablets. This is crucial for businesses and organization who want to use their app as a distribution, informational or sales medium. After all, if you don’t have any downloads then what’s the point of building the app in the first place? With the banner ad design you’ll notice that there is limited space for placing text. There's only a few options for customization, and rightly so, since you don’t want this ad to take up your whole website. But this leaves you with a dilemma for creating something that communicates everything about your app. Let’s take a look at five creative ways to use custom mobile app banners. The banner text area only allows 35 characters, meaning that you need to figure out the best words to grab reader attention and convince them to click on the banner ad. It’s not always easy to think of this content, but the best option is to focus on the benefits of your mobile app. Can they download it for free? Do they receive a free promotion just for downloading it? Do they receive upcoming product photos? Regardless of what you put it’s nice to use shorthand so that you fit everything that’s necessary. Inside the Custom Mobile App banner you’ll notice an area for developing a ribbon. This ribbon is nice for adding a little extra text and really hammering down the idea that you are trying to get across in the banner text. Since we want to keep the banner small enough to not distract from normal website happenings the ribbon area is quite restrictive. In fact, the ribbon area only allows five characters, which leaves you wondering how to even utilize it. Keep in mind that the ribbon is not a place to cram in a bunch of text. The reason it’s only five characters is because it’s reserved for short text that packs a punch. If you can’t figure out how to fit the text in the ribbon area then it’s not good enough to put there anyway. 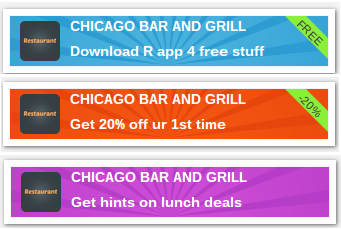 The best advice for using the ribbon is to highlight discounts. This grabs attention from customers and you can fit this text within just five characters. This discount number gives people an idea of what types of promotions they receive when they actually download the mobile app. Another great way to use the ribbon is to write the text “Free.” This makes it clear to people that they don’t have to spend a dime to download the app. Once you are done with designing your mobile app banner click the Create Banner Button to move on. One way to really take advantage of the banner ads is to download and save as many versions of the ad as possible. The dashboard gives you options to create mobile or website ads, then you simply copy the code into your website. This keeps you relevant on both mobile and computer platforms. Each option has different sizes for customization, and you have the opportunity to save an image version of your banner ad if you want to manipulate the banner ad yourself or place it on an offline document. If you do place it on an offline document then you want to include a link below it or a QR code for people to scan and download it onto their phone. If you have created a custom mobile app banner ad in the past then let us know in the comments how it went. If you are still a noob and need some help getting your banner ad setup then share your thoughts and concerns so we can help you out.